Thanks to Juan Trinidad of the Philippines who has kindly provided the information in Italics on this page. This may need to be done any time you remove the focusing ring and/or the front element from the camera. Fine tuning is done by taping tracing paper/wax paper at the film plane (where film should be in relation to the lens) with the back of the camera open. 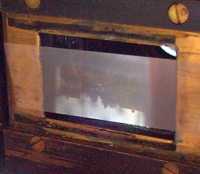 Alternatively Scotch Magic tape is a quick and easy solution to make a focusing screen that stays in place. The slightly mat translucent surface is very easy to focus on. Point the camera at a bright subject 1/2 mile away with the aperture set at maximum opening (4.5 on my camera) and hold the shutter open via BULB (I used a shutter release cable to help me keep the shutter open) . You will see an inverted image of you subject. Look very carefully and focus the image by turning the lens element. Once you are satisfied with the focus, reinsert focusing ring with the indicator set to read infinity. You can further fine tune the focus by doing the same procedure with a bright subject at exact 1.5 meters away from the front element of the camera. Do the same but do not stray away too much from the previous adjustment to keep infinity. The setting here should read exactly 1.5 meters. Double check settings at infinity and 1.5 meters. Compromise settings if necessary. Bingo, a calibrated focusing ring. If you do these adjustments together with adjusting the rangefinder, the rangefinder should serve its purpose of helping you to set focus ring when taking a picture.